Green/sustainable solutions for the restaurant and food processing industry. Compostable food service items, paper products plus bio-remedial cleaners degreasers to handle the toughest fat, oil and grease problems. (spray Bottle; 24oz) Touch plastic Spray Bottle Marked ounces and Milliliters measurement. includes standard Blue Nozzle. Sprayer adjust from line to steady stream. Bottle size is 24oz. 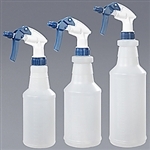 minimum order of 6 (spray Bottle; 32oz) Touch plastic Spray Bottle Marked ounces and Milimeter measurement. includes standard Blue Nozzle. Sprayer adjust from line to steady stream. Bottle size is 32oz. minimum order of 6 (Scooper; 2 Quarts) a 2 quarts scoop. 6 spray bottles size is 16 oz Our plant fiber based products are now made from sugarcane (bagasse) and wheatstraw fiber. Sugarcane and wheatstraw are not only annually renewable resources, but can also be turned into products normally made from plastic or paper. Bagasse is the sugarcane fiber remaining after extraction of juice from sugarcane and the wheatstraw is the remaining plant material after the wheat grain and chaff have been extracted. We use these byproducts to make compostable tableware. World Centric products are some of the highest quality compostable products in the market. They are created with renewable resources, such as sugarcane, reed, corn, and potato starch. Their product line consists of biodegradable & compostable plates, bowls, cups, cutlery, containers, and clamshells. Our plant fiber based products are now made from sugarcane (bagasse) and wheatstraw fiber. Sugarcane and wheatstraw are not only annually renewable resources, but can also be turned into products normally made from plastic or paper. Our plant fiber based products are now made from sugarcane (bagasse) and wheatstraw fiber. Sugarcane and wheatstraw are not only annually renewable resources, but can also be turned into products normally made from plastic or paper. Bagasse is the sugarcane fiber remaining after extraction of juice from sugarcane and the wheatstraw is the remaining plant material after the wheat grain and chaff have been extracted. We use these byproducts to make compostable tableware. World Centric products are some of the highest quality compostable products in the market. They are created with renewable resources, such as sugarcane, reed, corn, and potato starch. Their product line consists of biodegradable & compostable plates, bowls, cups, cutlery, containers, and clamshells.